Item 8B -- the bullet utilized expands to an inch or more in diameter at our velocities, and hence penetration is limited to about two feet in flesh and bone. This is the single most effective hog and black bear load ever devised in 45-70. I don't use it on animals weighing more than 800 lbs as it won't give adequate penetration at bad angles for animals larger than 800 lbs. If you'll limit yourself to broadside (double lung) and CNS hits, this load will work on 2,000 lb animals. Item 8C -- The bullet we utilize in this load is very tough and gives only a small to moderately sized mushroom (about .60 cal) and because of the smallish mushroom, it penetrates very deep -- about 4 feet in muscles and bone and as such is a great bullet for use on dangerous game and smaller game too as it does expand some. This load is the most versatile of our 45-70 loads. Have been using the 8b ammo on eastern North Carolina black bears for the past 8 years killing bears from 220-675lbs with NO problems!! When the hounds have a big 500lbs bear bayed out/treed you need ammo that is going to do the trick the first time!!! I just wanted to email you guys about the great hunting season I had this year. With your 45-70 8B ammo I took a nice whitetail buck at 190 yards thru both lungs. The entry wound was impressive as was the damage to both lungs. Two days later I shot a cow elk at 348 yards thru the upper neck/spine. Your advice on peep sights & ammo was spot on & gave me the confidence to take those shots. Having practiced at 200 yards extensively with some 300-yard shots mixed in also at the range was important, but knowing that heavy bullet would do its job was the kicker. Thanks again & I now have a stockpile of 8B & 8A for future use. Using them 1886 certainly added to this year's hunt. 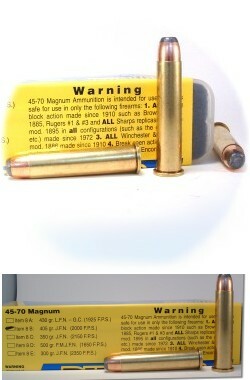 Here are the 2 pix that I put together to show the expansion of the 405 gr. JFN. It did its job and was very impressed the way it performed on the Buffalo that I took a couple of weeks ago. It was a Cow and was in the 8 to 900-pound range. It was just the size I was looking for. It lodged on the exit side in the skin after going threw bout 30 " of flesh and bone. I have some 500, and 540 grs. but this 405 served the purpose. Just took my 2nd black bear using 8B, 405 JFN out of my Marlin GG. Bear about 30 yards quartering away.bullet entered left side (lung) and exited right side (and upper arm). Bear only went 20 yards (downhill) before expiring. The blood trail (amount of) was amazing. This ammo is #1. Please keep making it! 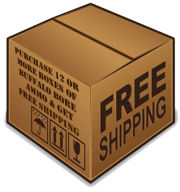 I have run buffalo bore ammo consistently in my both my .45-70 calibered guns (Ruger No. 1 and Marlin Guide Gun) and have had spectacular results. My recent a black bear @ 35 yards and was instant lights out !! No tracking required. I shot this canadian black bear with my marlin guide gun (stainless w leupold scout scope) and the buffalo bore 405gr JFN (8B). Bear was facing away from me and the shot angle from above left hip into the chest cavity...bear ran 20 yards before dropping. This round was devastating to say the least. Great penetration, a few feet (despite it being labeled an 'expander') and dramatic results. The bear was just shy of 300 lbs. I have had incredible accuracy with the BB 350 and 405 JFNs. Great products. 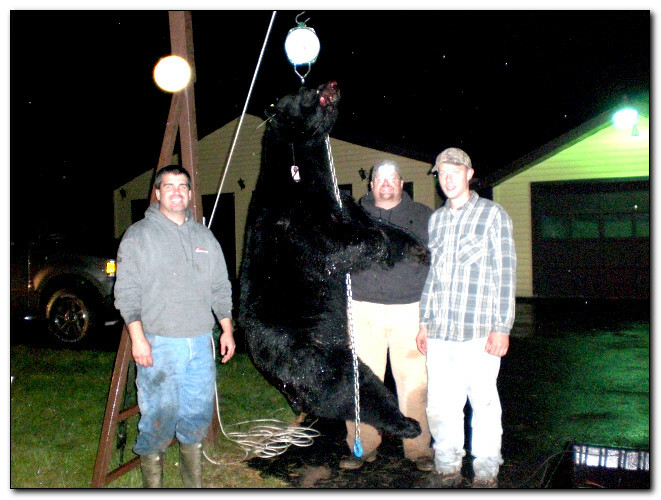 This 500 Lbs Bore was taken October 2, 2009 near Minong, Wisconsin with 405 gr, jfn Buffalo Bore ammunition shot out of a Marlin guide gun. One shot through both shoulders. Bullet exited in one piece. Also, I wanted to thank you for the great ammo. My friend and I just came back from a hog hunt were I bagged a 300 lb sow with the 180 gr. Heavy 357 Magnum Buffalo Bore round. My friend Ralph, bagged a 425 lb boar using the Buffalo Bore 405 gr. 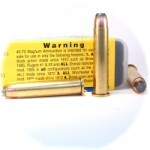 45/70 Magnum ammo. In both cases, the ammo worked perfectly. I only wish that you had the heavy 30-30 round ready. Catching up from my Russian boar hunt in Iowa a couple weeks back. 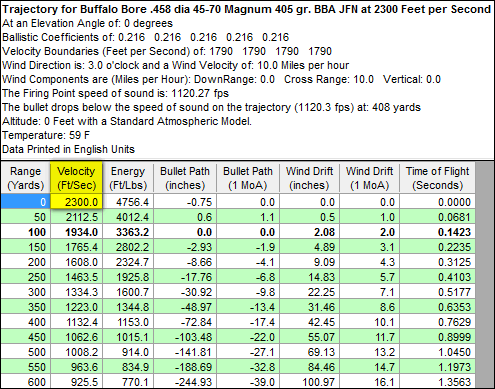 All I can say is, as promised, Buffalo Bore truly delivered outstanding terminal performance! One shot at a running boar from about 20 yds. with my Marlin .45-70 and he piled up in a grunting heap. You were right on with your call on the 405 gr. JFN bullets ... devastating! Heading for black bear next year, and Buffalo Bore will be in the magazine.